Parliamentary panel of Rajya Sabha has remarked that slashing of AAI budgetary support will hit the airport development programme in Northeast. 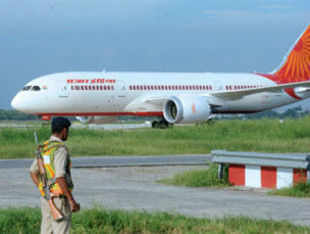 Guwahati, May 11 : Parliamentary panel of Rajya Sabha has remarked that slashing of Airport Authority of India's (AAI) budgetary support will hit the airport development programme in Northeast India. Department related parliamentary standing committee on transport, tourism and culture has in its recently submitted report stated that budgetary support in the form of Grants-in-aid provided to AAI in annual plan 2013-14 is Rs 42 Crore, out of this Rs 32 Crores has been earmarked for the project at Pakyong (Sikkim) in the North Eastern Region and the balance amount of Rs 10 crores for construction of new terminal building including apron at Tirupati airport. crores in 2013-14. Out of this, Rs. 32.00 crore is exclusively for development works at airports in Pakyong and Tirupati. The Committee was informed that AAI's requirement for various projects under Grant-in-Aid Schemes is to the tune of Rs 460.21 crores. The Committee feels that such a drastic cut in budgetary support for the airport infrastructure developer of the country will definitely slow down the ongoing projects especially in North-Eastern Region. The Committee hopes that necessary funds will be allocated to AAI at the revised estimate stage so that its ongoing as well as future projects are not delayed for want of funds. during 2012-13 which needs a lot of improvement. Slow progress in case of North Eastern Region projects is a cause of concern to the Committee. The Committee recommends the Ministry to take necessary steps urgently to finalize/approve these Plan schemes at the earliest to spend the allocated funds during the current year. Union minister of State for Civil Aviation, K.C. Venugopal recently stated that at present, scheduled air services are available at nine airports in the NE Region viz. Agartala, Lengpui ( Aizawl), Bagdogra, Dibrugarh, Dimapur, Guwahati, Imphal, Jorhat and Silchar. In addition, Lilabari, Shillong and Tezpur are also operational airports but scheduled flights are not operating from these airports at present. Shillong airport in Meghalaya is an operational airport. However, at present no commercial operations are taking place from this airport. AAI has constructed a new terminal building at Barapani (Shillong) airport with an allocation of Rs 28.27 crores in the 11th Five Year Plan. The work commenced in June 2009 and completed in May 2010 at a cost of Rs.29.70 crores. There is a proposal for expansion and modernisation of Shillong airport and Rs 75.65 crores has been earmarked for this project in the 12th Five Year Plan. Move is on to develop at least eight airports in Northeast India. Greenfield airports are coming in Sikkim and in Itanagar in Arunachal Pradesh. Northeast India has 23 airports out of which 12 are operational. Several non operational airports are expected to be developed by the 12th plan period. Guwahati airport is the ninth biggest airport in terms of traffic. The airport has 95 movements per day (this includes 42 scheduled departures and landing).